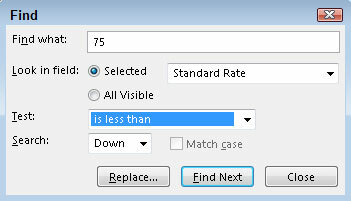 You’ve probably used the Find feature in other software to find a word or phrase or number. That’s child’s play compared with Project 2016’s Find feature, which can find you a backhoe, a corporate jet, or even a person! You can use Project’s Find feature to look for resources with certain rates or in a certain workgroup. You can search for resources by their initials, their maximum assignment units, or their standard or overtime rate, for example. Perhaps you need to find a material resource that is a chemical measured in gallons, but you can’t remember its exact name. In this case, you can search for resources whose material label includes the word gallons. To find resource information, you must be working in a resource-oriented view. To find task information, you must be working in the task-oriented view. On the Task tab, click Find in the Editing group. The Find dialog box appears, as shown. In the Find What box, type the text you want to find. For example, type 75 if you want to search for a resource with a standard rate of $75 per hour or less, or type water if you want to find a resource whose material label contains that word. From the Look in Field list, choose the name of the field in which you want to search. The default field is Name. When you click the drop-down arrow, you see all kinds of different fields you can search. For example, to search for resources that have a maximum unit-assignment percentage of more than 100 percent, choose the Max Units field. Or choose Standard Rate to search based on the resource’s hourly rate. In the Test box, select a criterion. The default value is contains, but when you click the drop-down arrow, you see lots of options. For example, if you’re looking for maximum units of more than 100 percent, Is Greater Than is the best choice. For a rate less than $75 per hour, try Is Less Than. If you prefer to search backward from the current location (that is, the selected cell in the task list) instead of forward, choose Up from the Search box. If you want to match the case of the text, select the Match Case check box. To begin the search, click the Find Next button. Continue to click Find Next until you find the instance you’re looking for.